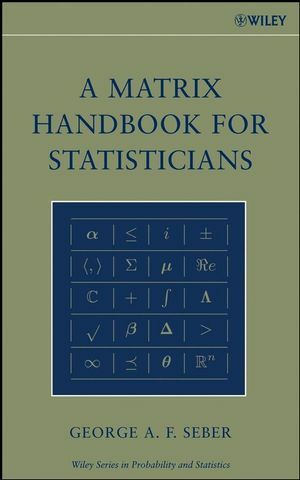 This timely book, A Matrix Handbook for Statisticians, provides a comprehensive, encyclopedic treatment of matrices as they relate to both statistical concepts and methodologies. Written by an experienced authority on matrices and statistical theory, this handbook is organized by topic rather than mathematical developments and includes numerous references to both the theory behind the methods and the applications of the methods. A uniform approach is applied to each chapter, which contains four parts: a definition followed by a list of results; a short list of references to related topics in the book; one or more references to proofs; and references to applications. The use of extensive cross-referencing to topics within the book and external referencing to proofs allows for definitions to be located easily as well as interrelationships among subject areas to be recognized. Additional topics, such as rank, eigenvalues, determinants, norms, generalized inverses, linear and quadratic equations, differentiation, and Jacobians, are also included. The book assumes a fundamental knowledge of vectors and matrices, maintains a reasonable level of abstraction when appropriate, and provides a comprehensive compendium of linear algebra results with use or potential use in statistics. A Matrix Handbook for Statisticians is an essential, one-of-a-kind book for graduate-level courses in advanced statistical studies including linear and nonlinear models, multivariate analysis, and statistical computing. It also serves as an excellent self-study guide for statistical researchers. George A. F. Seber, PhD, is Emeritus Professor in the Department of Statistics at The University of Auckland in New Zealand. A Fellow of the New Zealand Royal Society, he is the author or coauthor of several books, including Nonlinear Regression, Multivariate Observations, Adaptive Sampling, Chance Encounters, and Linear Regression Analysis, Second Edition, all published by Wiley. Dr. Seber's research interests have included statistical ecology, genetics, epidemiology, and adaptive sampling. 1.2 Some Continuous Univariate Distributions. 2. Vectors, Vector Spaces, and Convexity. 2.1.3 Sums and Intersections of Subspaces. 2.2.4 Column and Null Spaces. 2.5 Convex Sets and Functions. 3.7 Maximal and Minimal Ranks. 4. Matrix Functions: Inverse, Transpose, Trace, Determinant, and Norm. 4.4.4 Expansion of a Determinant. 5. Complex, Hermitian, and Related Matrices. 6. Eigenvalues, Eigenvectors, and Singular Values. 6.1.4 Functions of a Matrix. 6.2 Variational Characteristics for Hermitian Matrices. 6.4 Inequalities for Matrix Sums. 6.5 Inequalities for Matrix Differences. 6.6 Inequalities for Matrix Products. 7.3.2 Minimum Norm (g14) Inverse. 7.3.3 Minimum Norm Reflexive (g124) Inverse. 7.3.4 Least Squares (g13) Inverse. 7.3.5 Least Squares Reflexive (g123) Inverse. 7.6 Some General Properties of Inverses. 8.1 Orthogonal and Unitary Matrices. 8.3 Circulant, Toeplitz, and Related Matrices. 8.6.2 Sums of Idempotent Matrices and Extensions. 8.6.3 Products of Idempotent Matrices. 8.12 Vandermonde and Fourier Matrices. 8.14 Some Miscellaneous Matrices and Arrays. 8.14.2 Nilpotent and Unipotent Matrices. 8.14.4 Stable and Positive Stable Matrices. 9. Non-Negative Vectors and Matrices. 9.1.2 Modulus of a Matrix. 9.3 Canonical Form of a Non-negative Matrix. 9.4.3 Non-negative and Non-positive Off-Diagonal Elements. 9.6.2 Finite Homogeneous Markov Chain. 9.6.3 Countably Infinite Stochastic Matrix. 9.6.4 Infinite Irreducible Stochastic Matrix. 10. Positive Definite and Non-negative Definite Matrices. 10.4.1 Non-Negative or Positive Definite Difference. 10.4.2 One or More Non-Negative Definite Matrices. 11. Special Products and Operators. 11.1.2 More Than Two Matrices. 12.1.1 Real Vector Inequalities and Extensions. 12.2 H?older?s Inequality and Extensions. 12.3 Minkowski?s Inequality and Extensions. 14.4 Positive and Non-Negative Definite matrices. 15.4 Matrices With Repeated Elements and Blocks. 16.2 Reduction by Elementary Transformations. 16.3 Singular Value Decomposition (SVD). 16.6 Further Diagonal or Tridiagonal Reductions. 17. Differentiation and Finite Differences. 17.2.1 Differentiation with Respect to t.
17.2.2 Differentiation With Respect to a Vector Element. 17.2.3 Differentiation With Respect to a Matrix Element. 17.3 Vector Differentiation: Scalar Function. 17.3.3 Function of a Function. 17.4 Vector Differentiation: Vector Function. 17.5 Matrix Differentiation: Scalar Function. 17.7 Matrix Differentiation: Matrix Function. 17.10 Matrix Linear Differential Equations. 18.3.2 Exterior (Wedge) Product of Differentials. 18.3.5 Patterned Matrices and L-Structures. 18.5 Jacobians for Complex Vectors and Matrices. 18.6 Matrices with Functionally Independent Elements. 18.7 Symmetric and Hermitian Matrices. 18.8 Skew-Symmetric and Skew-Hermitian Matrices. 18.9.2 Nonlinear Transformations of X. 18.9.3 Decompositions With One matrix Skew Symmetric. 18.9.6 Hermitian Positive Definite Y. 18.10 Decompositions Involving Diagonal Matrices. 18.10.3 Symmetric and Skew Symmetric Matrices. 19. Matrix Limits, Sequences and Series. 20.5.2 Quadratics in Normal Variables. 20.5.5 Independence of Several Quadratics. 20.7.1 V is the Identity Matrix. 20.7.2 V is Positive Definite. 20.7.3 V is Non-negative Definite. 20.8.2 Elliptical and Spherical Distributions. 21.5.1 Principal Component Analysis (PCA). 21.5.3 Canonical Correlations and Variates. 21.6 Procrustes Analysis (Matching Configurations). 21.7 Some Specific Random Matrices. 22. Inequalities for Probabilities and Random Variables. 22.6.3 Inequalities For Other Distributions. 23.3 Probabilities and Random variables. 24. Optimization and Matrix Approximation. 24.2 Using Convex and Concave Functions. 24.4 Optimizing a Function of a Matrix.